Browse our knowledge base to get answers to frequently asked questions such as how to place an order and when you can expect your tickets. Category I would like help before I place an order. I have delivery questions about my order. I have received my order and have questions about the tickets. I have a general question about my order. Please enter a valid order number. Please enter additional details about your inquiry. Your email support request has been successfully submitted. You should expect a response no later than 24 hours. Your email support request failed to send. Customer Service calls are prioritized for customers with events within 48 hours. Inventory We are a resale marketplace, not a box office or venue. Ticket prices may exceed face value. This site is not owned by Bon Secours Wellness Arena . The Bon Secours Wellness Arena is a multipurpose arena built in 1998 at a total construction cost of $63 million in Greenville, South Carolina. 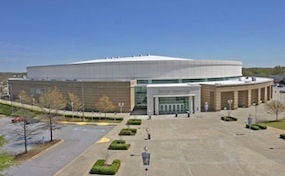 The Bon Secours Wellness Arena is mainly used for concerts. The seating capacity offered by the Bon Secours Wellness Arena box office is 15,591 for most concerts. The Bon Secours Arena has hosted a couple different NCAA Basketball Tournament games. However, due to current regulations it is not eligible to host any of the games until the Confederate flag is taken off display at the South Carolina State House. Common Bon Secours Wellness Arena tickets include the PBR Series, WWE, Monster truck rallies, motocross racing, ice skating, and dog shows. First founded by The Lions Club, the original stadium was built in 1958. It took twenty years for The Lions Club to complete, even with the club’s active support. A few hindering aspects that delayed completion were World War Two, lawsuits, and even internal disagreements over the design. Before its grand opening, the venue hosted a basketball game between Furman University and West Virginia. In the 1990’s the BI-LO center, as it was originally called, was completely overhauled and is now known as the Bon Secours Wellness Center. ArenaGreenville.com is not affiliated with any primary vendor or box office. We are a privately held company that specializes in providing a large supply of online inventory at the lowest prices. To purchase tickets to any Bon Secours Arena events simply click on the event of interest or call our operators at anytime.